One playful moose babies in Alaska seems all set for summer. The moose family was caught on camera running and playing with a garden sprinkler - just like a child would on a hot day - and could not stop coming back for more. These baby moose twins don’t care about human rules when they find their new favorite toy in an Alaskan family’s yard, though. We can all live vicariously through these adorable rebels for a moment by appreciating their curiosity and daring. The Alaska Moose (Alces alces gigas) or Giant Moose or Alaskan Moose is a subspecies of Moose that ranges from Alaska to western Yukon. The Alaska Moose is one of the largest subspecies of moose. Alaska Moose inhabit boreal forests and mixed deciduous forests throughout most of Alaska and most of Western Yukon. Like all Moose species, the Alaska Moose is usually solitary but sometimes will form small herds. Typically, they only come into contact with other moose for mating or competition for mates. During mating season, in autumn and winter, male Alaska Moose become very aggressive and prone to attacking when startled. 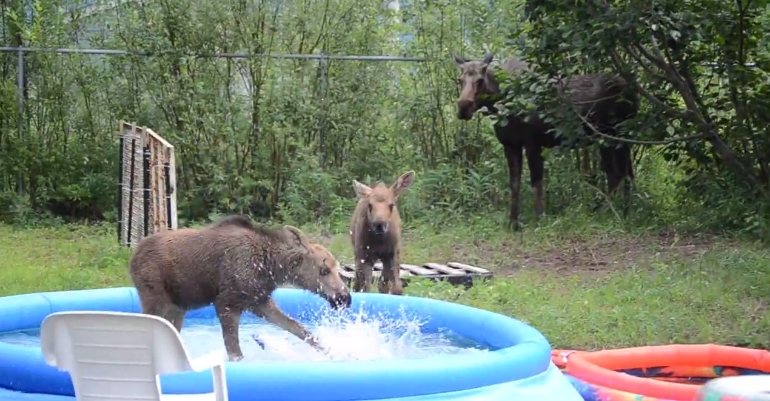 Responses to "Adorable Twin Moose Babies Play In Swimming Pool Of A Family's Yard In Alaska"
Beautiful, even baby animals love to play.